THE Hilton hotel, set along the bustling shopping district of Orchard Road, has service managers, chambermaids and security guards looking after its 422 rooms. But not many people know that the 24-storey accommodation has another caretaker. Guan Yin, the Taoist Goddess of Mercy, stays vigil in a room hidden at a corner of the ground-floor car park. Or at least, the statue of the deity does. “She has been protecting the hotel all these years,” service manager Fernando says – and believes. The man in his 50s had brought Guan Yin to her present location from his third-storey office when it was converted into a discotheque. There, fights between dance ladies would occasionally break out. “You can’t let her see such ‘dirty things’,” he adds. The altar that the goddess stands on – an elaborately-carved wooden shelf set aglow by red prayer lamps – is just one of numerous prayer spaces existing in car parks, back alleys and staircase landings of shopping centres and offices in the area. Many who throng the district, drawn to the comfort of air-conditioned malls and the array of retail products, would turn a blind eye to them. But not Fernando, who takes 10 minutes off his daily hour-long break to pray to the deity. The nearest mosque along Orchard Road might just be a ten-minute walk away from Wisma Atria Shopping Centre, but the mall’s Muslim employees prefer to pray on an unused staircase landing instead. “It’s much easier when we have our own prayer space here,” says technician Salleh Yusop, 48, whose job requires him to be within the building at all times. This musollah, or Muslim prayer area, boasts pristine carpets, copies of the Koran on a shelf, framed Arabic calligraphy and an electric fan. It is much more elaborate than other musollahs that typically consist of nothing more than a mat. While there is a mosque only 10 minutes away, Wisma Atria Shopping Centre’s Muslim staff prefer to pray here. This is a more convenient venue for the workers who need to be in the building at all times. While offices in Wisma Atria have their own prayer areas, this one on the staircase landing is used and maintained by a group of 10 Muslim staff from the housekeeping, maintenance and security departments. “Keeping it beautiful is a sign of respect for our religion,” says Salleh. For those who spend most of the day at their work places, they make do with unused spaces in buildings to worship. “Musollahs help staff to perform their daily prayers in a short period of time,” says Feirul Maliq Bin Intajalle of Islamic council Majlis Ugama Islam Singapura (MUIS). “The room doesn’t need to be built in any special way as long as Muslims can face the kiblat direction of 293 degrees, clockwise from North,” he explains. At nearby Liat Towers, security guard Hashim Bin Salleh prays on a staircase landing in the car park, away from the public’s eye. “Privacy really isn’t an issue when it comes to praying, but because of our environment it has to be so,” says the 59-year-old. 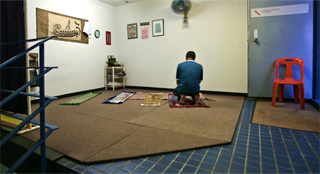 In multi-religious Singapore, praying is often done in private to avoid offending others. This is unlike Muslim-majority countries like Pakistan, where it’s common to see devotees doing so openly on the streets. Despite the wide availability of official religious sites such as temples and mosques, “people still find spaces and opportunities to express their own religiosity,” says Professor Lily Kong, a cultural geographer from the National University of Singapore. “Nothing is completely planned,” she adds. Hawker Wang Ye Cai, who runs the Yuan Chun Famous Lor Mee stall at Amoy Street Food Centre, set up an altar there more than 20 years ago. The permitted space for Wang’s altar is a vacant corner at the edge of the hawker centre, away from all food stalls. In this way, it doesn’t become an obstruction to the crowds that visit the popular hawker centre. Yet, its remote location has not stopped passers-by from noticing it. Besides hawkers and cleaners, employees working at nearby offices also drop by daily to offer incense. Like other food centres, the altar is maintained by a Hawkers’ Association, which Wang is chairman of, as part of a Taoist tradition. The figurines of Guan Yu, Tai Sui, and Guan Yin are housed inside, and devotees pray to these gods for wealth, goodwill and protection from demons. The structure, which is the size of a door frame, is made of aluminium and cost the hawkers about $2,000 to build. But it is a lot less elaborate than Wang’s previous one which spanned the width of a shopfront. Five years ago, after the food centre underwent a facelift, Wang was only allowed an altar space half its original size. Despite its new location and size, NEA recently received an e-mail questioning the presence of the altar and whether it was allowed in a public space. When Wang was informed about it, he was angered. People no longer recognise the significance of such prayer spots, he complains. “Our younger generation doesn’t understand why we need these altars,” says the man in his 60s. "The Chinese religious people are flexible. If you ask them to move their altars they'll move it anywhere. Sometimes they let the gods decide where the altars should be."